Me leaning against a wall, trying to look like I do this sort of thing all the time. 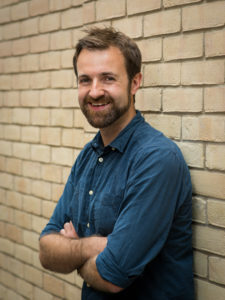 Kit Yates is a Senior Lecturer in the Department of Mathematical Sciences and co-director of the Centre for Mathematical Biology at the University of Bath. He completed his PhD in Mathematics at the University of Oxford in 2011. His research demonstrates that mathematics can be used to describe all sorts of real-world phenomena: from embryo formation to locust swarming and from sleeping sickness to egg-shell patterning. He is particularly interested in the role that randomness plays in Biology. His research into Mathematical Biology has been covered by the BBC, the Guardian, the Telegraph, the Daily Mail, RTE, Scientific American and Reuters amongst others. Along side his academic position, Kit is also a burgeoning author and science communicator. His first book, “The Maths of Life and Death“, will appear in autumn 2019, published by Quercus. Kit’s writing about the enjoyment and ubiquity of Mathematics has appeared in the Guardian, the Times, the i, the independent, the Daily Mail, and popular science publications such as Scientific American and IFLscience as well as having over 1.1 million reads on the Conversation. He has also made appearances on the BBC’s “Bang goes the theory” and even on Watchdog. Kit has also sets real-world-based mathematical puzzles which have appeared in a range of newspapers, on tube adverts and on the radio. He also shares his enthusiasm and love of Mathematics in keynote speeches at conferences, festivals as well as schools and workshops as part of his role as widening participation, outreach and engagement officer at the University of Bath. If you’d like Kit to come and give a talk please contact his agent Chris Wellbelove.